Well, we knew it was coming eventually. But if reports from two major sports news outlets are accurate, the Naval Academy will make it official soon, joining the Big East as a football-only member in 2015. Both CBSSports.com and ESPN.com are reporting an announcement is imminent; CBS says it’ll come Tuesday. The move would give the Big East 11 football members for the 2015 season and be the latest in a series of shakeups: By the time Navy joins up, Pitt, Syracuse and West Virginia will be out and Boise State, Houston, Southern Methodist, Central Florida and San Diego State will be in. Yes, San Diego State. In the Big East. It’s best not to think about it too hard. The conference likely isn’t settled in yet, either. If a 12th football school signed on, the Big East would reach the minimum required to hold a conference title game, giving it another revenue stream and a cherry to put on top of a yet-to-be-negotiated TV deal. 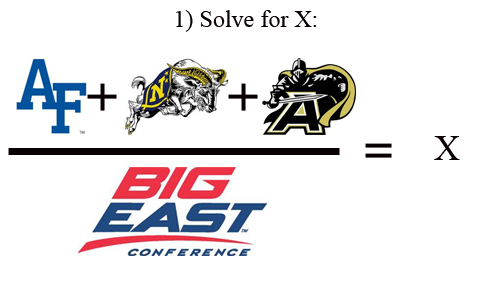 It’s entirely too early to speculate on division alignments, but Navy could fit in a “Big East East” along with current Big East members Connecticut, Rutgers, South Florida, Cincinnati and Louisville. That would leave a “Big East West” with the five new, non-Navy members and another late addition. Air Force said no in December when Big East expansion talks heated up, opting to remain with the Mountain West Conference. But things have changed with the MWC since then — that conference has been in merger talks with Conference USA that could lead to a 16-team megaconference. And joining a conference with Navy would make that academy rivalry a league matchup, freeing the Falcons to schedule a nonconference opponent of their choosing instead of filling up that nonleague spot with the Mids. Confused yet? Join the club. But once official word comes down from Annapolis, expect some of the cloudy conference picture to get a little clearer.